Measuring flooring layouts is not an easy task. It's very easy to lose accuracy because of the distances involved. If you are not careful, it's possible to be 0.5-1" off on the other end of that 25ft hallway. Naturally I tried to find a better way. Enter the Stanley 77-118 S2 Laser Level and Square. While a tape measure can bend, a laser cannot. Like all laser tools, the S2 projects a laser beam. In the case of the S2 there are two beams oriented at a right angle to each other. The beams are visible indoors, but wash out in direct sunlight. They are about 1/16 thick and dead straight. The square is powered by 3 AA battery. This a very economical solution that drives the price of the tool down. If you are a contractor and plan on using the square all day long, you'll find yourself buying a lot of batteries. Each laser has it's own built-in bubble level. In a vertical scenario one of the levels is used to level a laser. The other laser will be vertical, since it is projected at 90 degrees to the other. On a flat surface leveling both lasers levels the square. This is not very useful, because the square does not need to perfectly level to function. The S2's strong point is corner the two laser meet. The square was clearly engineered to be placed up against the corner of a square object. This makes the S2 ideal for laying tile. Place it against the corner of the first tile and the square projects perfect layout lines for you. Each laser can be used individually as a line laser. I used this capability to install wood flooring. Over ~35ft the laser is much more accurate than a chalk line. Here is what Stanley has to say about their S2 and XP180 lasers. If you plan on setting the level on the floor and seeing continuous beams for 20ft+ you will be disappointed. Not because of the Stanley S2, but because of your floor and walls. In most cases the laser beam will be interrupted by unevenness in your floor or wall. The Stanley get around this by projecting the laser beam from an inch above the surface the level is sitting on. The laser is angled slightly downward. The floor can rise and fall a little, as long as it does not move above the level of the laser. On the jobsite you'll find that the beam will terminate after about 10ft. That's about as flat as homes are these days. It is important to stress that this is not a problem of the S2. If you require continuous lines on a wall or floor, you are better served by as tool that projects said lines from a tripod. That gives the laser the required height to create a truly continuous beam. Even if the beam is partially obscured, the S2 can still be useful. If a target, for example your hand, is placed in the path of the beam, the line appears on the target. This will produce a much stronger line, because the laser hits the target at a right angle. This technique can be used to greatly extend the range of the square. My square had no problems reaching the other side of my house 50ft away. The square uses putty to stick to walls. The customer must stick the putty to the bottom of the square. It does not come factory installed. The putty sticks to the bottom of the square the same way it sticks to the wall. Two plungers and finger holes help with removing the square from a wall. There are several problems with this design. For one, there is no groove for the putty in the bottom plate of the square. Once the putty is applied, the square can no longer sit level on a flat surface. The unevenness of the putty moves it out of level. The putty itself works, but not very well. I was able to stick the square to a wall, but I was less than confident about it staying there for long. A homeowner might find this ability useful, but on a jobsite the putty will fail. It's just a matter of time. I consider the S2's advertised ability to stick to walls a total loss. That's not surprising, considering that there is no product I know of that can do this reliably. All contractor grade products are secured to a surface with screws or are mounted on a tripod. 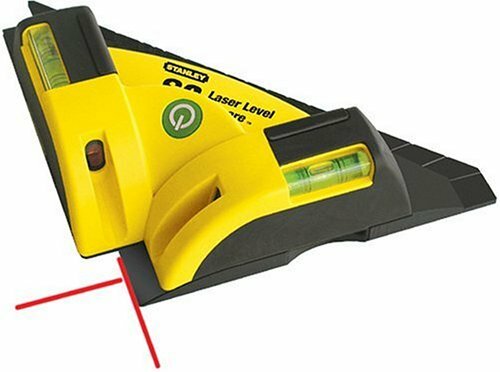 If you require lines on wall, you are far better of purchasing a line laser, such as the DeWalt DW087Kor Stanley's own XP180, that projects the lines on the wall while located on the floor or on a tripod. The Stanley 77-188 S2 laser level and square excels at short to medium range layout tasks on level surfaces. It's second to none for laying tile. I used it successfully for laying down hardwood flooring over distances as great as ~35ft. Framers can use the square to align interior walls. The S2's beams are bright and consistent. Accuracy is dead on. The 77-188 S2 very reasonable price makes it a great first laser. Unfortunately the tool is being marketed as great option for vertical layout work. Walls and vertical surfaces are things that don't go well with the S2. There are better options for those who are looking for vertical layout lines. The Stanley S2 is not a jack of all trades. It's a solid occasional-use laser for level surfaces. Tile layers in particular will be delighted.